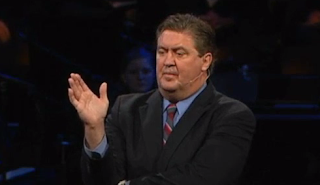 Leave it to Steve Gaines to once again preach a whopper of a tithing sermon in this season of tithing madness. "The act of taking something (such as money) from someone by using threats or deception." Gaines uses both threats AND deception in this sermon to try to convince his members they must give more to the church, else bad things might happen to them for "robbing God". Gaines uses Malachi 3 to tell Christians at his church that the thought of "robbing God" scares him - with the obvious implication that those who don't tithe should be scared not to give 10% to his church. Watch the video. I sure wish more Christians would wake up and see how terrible this is for a supposed "Man of God" to try to deceive people who really do believe the Bible, who really do look at him as a man sent to help them understand the Bible. He infers something bad will happen if they don't tithe, that they can't be intimate with God, and they can't fully worship God - unless they begin giving 10%. These preachers want to tell us that God loves us, and God forgives and forgets our sins - but that he also will work with "the devourer" to hurt us if we don't give 10% to the preacher's church. Which is it? They want us to believe God is some sort of mafia boss that collects on what he is owed. They make the gospel into "bad news". Gaines then goes into great detail to brag about how HE has tithed every bit of his income his entire life, since he was cutting yards in Dyersburg, Tennessee as a little boy. If only the people would be as holy as Steve, they too could be as blessed as he is. Show us the tax returns, Steve. And so ironic really: that of ALL the people in the building that morning who might possibly be "robbing God", it would be Steve himself. I mean if the people are giving money to the church, because it is God's money to do God's will - who is the one in the building who is taking most of it for himself to spend as he wishes? It is Steve himself who is taking hundreds of thousands of dollars per year to live a rather lavish lifestyle. "If you can't trust God with 10% of your money, are you really going to tell me that you can you trust him with your soul?" So you might not even be capable of being a Christian, of trusting God for salvation, unless you give 10%. That is spiritual abuse. It is a shake down. People of Bellevue Baptist Church, I'm sorry that this preacher does this to you in your own church. I know that for several decades you had Adrian Rogers as your preacher, and now you have to put up with this nonsense. "If you can't trust Steve Gaines to be truthful regarding your finances, how can you trust him regarding matters of your soul?" People of Bellevue are apparently too dumb to show this guy the door so I don't have any sympathy for them. I attended Gardendale for a short time after he arrived there but saw the light and left. He was spinning the same old yarn then as he does now. He knows it all and will tell you that pronto. Galatians 5:18 says "But if you are led by the Spirit you are not under the law". If we are not being led by the Spirit we are operating under the flesh,which is carnal. It seems that these that are teaching otherwise do not really trust that God is able to accomplish anything that He has ordained. His desperation is showing.... maybe the sheep are seeing thru this nonsense and are finally doing something about it. We live under grace, not under the OT law. Those "pastors" who pick and choose which OT laws they want to keep New Testament believers under will answer for it one day. They are making Christ's death in vain. Jesus was the fulfillment of the law, but they are just as bad as the Pharisees that Jesus was so critical of. It's "American Christianity" and I really think it's done more harm than good. Wake up! If the sheep see anything we would see them do something. They have evidently chosen to follow this man. If they do not believe what he is preaching they are staying for some other reason which is more important to them than truth. Remember "never sacrifice truth for unity" Bellevue Baptist Church has been hijacked. Question is who did it? Watchdog, have you ever seen this series "Woe to the Shepherds" ? It is really quite beautiful...and relates to all that you are exposing. Here is another teaching on the "Woe to the pastors"
I can't tell you how ingrained this teaching is in many Baptist churches. You heard Steve say his dad taught him this teaching. It is something that will some effort to discuss and dialogue with ministers about. I am convinced its a form of Replacement theology because Malachi 3 is about care of high priests doing their job in the Temple. Keynesian hypercapitalism has crept in and taken captives. Also tithing follows a seven year cycle, the seventh year no tithes were required. But somehow that's left out. Guess what happened the time the last seventh year occurred (2008)? Maybe Steve should figure out why the market crashed that year? While Watchdog's video is good, you really need to watch this sermon in its entirety to fully appreciate how off the rails Steve Gaines really is. A big name pastor in a big name church with a big time salary, and he seems to be completely void of joy. Why are people up for that again on Sunday, after getting beat up all week? Pastor Gaines is easy to figure out. But those who attend, you baffle me. Exactly. Someone once suggested watching him with the sound muted. The impression is that's one angry man. "Someone once suggested watching him with the sound muted." Part of the reason I am Catholic is because I am tired of the shake-down of tithing which is an old-covenant law. MANY protestant churches require it, incorrectly. MANY protestant churches do not. The "Bible" is their authority, yet their "Bible" is interpreted by one denomination as saying one thing and another denomination as saying the COMPLETE opposite. The Catholic church doesn't teach tithing. A random thought...Why is it that so many of the folks that "pound" the "succcess off tithing" are those that have "gotten theirs"?? Kinda like an Olympic gold medalist preaching that everyone could/should winat their sport AND if you dont win you didnt "train right or faithful enough". Pretty safe gig! Guess it wont work if instead you drag out the slew of folks barely making it and giving faithfully as they are lead!! No one wants to follow that example/model and live that way. A random thought...Why is it that so many of the folks that "pound" the "succcess of tithing" are those that have "gotten theirs"?? Because many of them have "gotten theirs" precisely by "pounding" people to tithe to the very same organizations off which they've "gotten theirs." I remember when Mac stated that he'd never seen a person who tithed go broke. As someone who almost did, I can assure you it happens. That was an OK sermon. It just didn't go far enough. Steve should have taught them that they paid 3 tithes in the Old Testament, and that Bellevue members will only get a blessing if they give 23% of their income to the church (undesignated). And it should all be paid in food (like it was in Malachi) and if they want to pay in cash there is a 20% penalty. Come on brother preach the Word! Scripture says II Cor 3-7 "Giving no offense in any thing, that the ministry be not blamed: But in all things approving ourselves to the ministers of God, in much patience, in afflictions, in necessities, in distresses,in stripes, in imprisonments, in tumults, in watchings, in fastings, By pureness, by knowledge,by longsufferings, by the Holy Ghost, by love unfeigned, by the word of truth, by the power of God". We can learn what is proper and in good order by listening to the real doctrines of the Bible ourselves and what God tells us to render to Caesar and unto Him. "The Catholic church doesn't teach tithing." They don't have to, Mark. They have their money making racket called purgatory. Just poney up and uncle alcoholic gets a free pass out of the hot seat. Yeah, what a scam. And don't even get me started on Indulgences. The children of the eighties remember the tele-evangelist corruption that went on, Tom. Watch a mass Exodus out of Bellevue and churches like them to continue. The house was purchased for $548,000. in August 2005. Current tax appraisal is $309,000 according to the Shelby County Property Assessors website. I realize this is an old thread, but I'm glad someone noticed this. All the following is PUBLIC information. While property values in Shelby County have certainly declined some in the last few years, I find it really stretching credibility to think someone would pay $548K for a house that, at the time, appraised for "only" $499K, AND that said house has depreciated to a mere $309K in 8 short years. Something smells. The other thing that may have a perfectly logical explanation but still smells funny is that Steve Gaines and Jamie Parker, whose country spread was purchased shortly after Steve's for $515K, both received identical mortgages in the odd amount of $359,650 from Regions Financial, the Sr. VP of which just happened to be the chairman of Bellevue's finance committee when Steve was hired by Bellevue. It seems dots could be connected.